Well I finally got around to making a Spatchcock Chicken or a chicken that has been butterflied. If you have teenagers--definitely use the word Spatchcock--LOL Drake and Rye have forbidden me to use the name in their presence, especially around their friends. It sounds so funny and then when you add an accent to it--it's freaking hilarious. I must be a 15 year old girl trapped in my 46 year old body. Some things just never change. I have had this fun love affair with accents and impersonations for some time. I am by far no Jimmy Fallon but I do enjoy mimicking sounds and phrases. I love reading Isabella books out loud. This forum allows me to try out new accents with new characters. My favorite, and this is probably a given, is an Irish accent. It rolls off my tongue so easily. 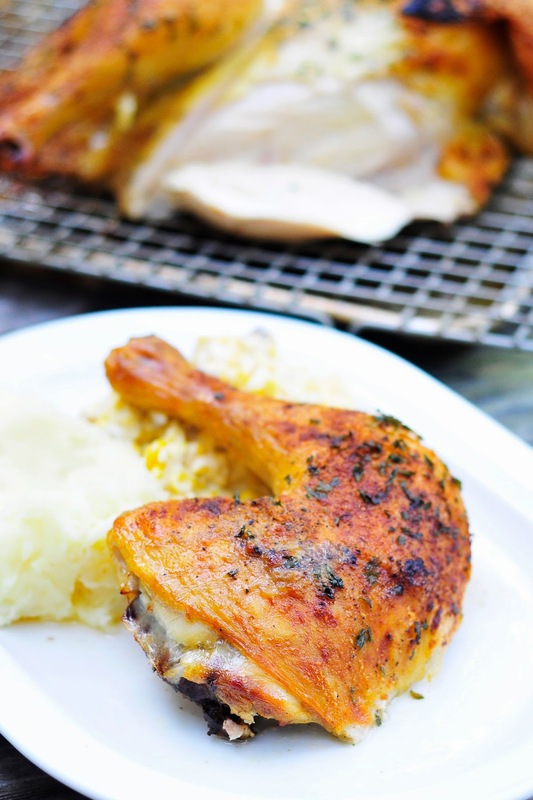 Outside of its funny given name, Spatchcock Chicken, is very good. I was a bit skeptical at first. Every picture featuring this dish always looked so beautiful. The skin (you know my love affair with skin) always looks crisp and golden brown. It's true--give me the chicken skin over the white meat. Now I may have to fight you for the dark meat. That is my favorite. I had to make the chicken and then eat the chicken to be completely convinced that this is the BEST way to cook a whole chicken. The meat on the inside of the chicken is cooked perfectly. Having the chicken parted down the middle and fanned out allows the chicken to cook faster and more evenly. It is cooked at a high temperature which allows the skin to be roasted to perfection. My first cut into the breast meat releases a clear juice that allows the white meat to glisten with doneness. 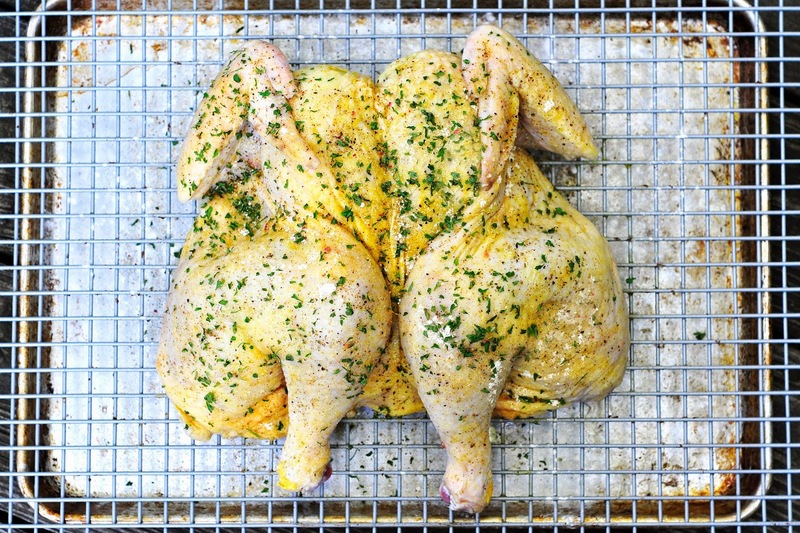 I usually buy thighs but lately I am finding myself buying more and more whole chickens to make this chicken: Spatchcock Chicken. Go ahead add your favorite accent. I wish I could say this is a fancy recipe with unique ingredients but it's not. 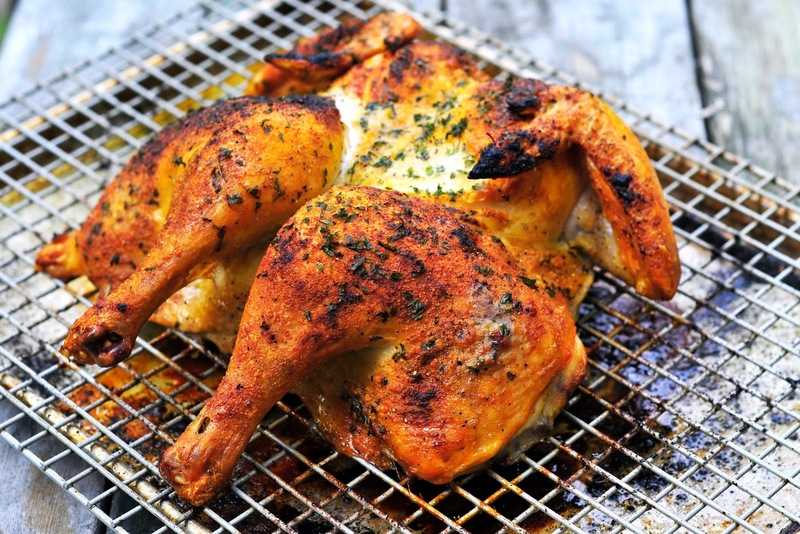 It is just a farm fresh organic chicken that has been seasoned with simple herbs, some juice, mayonnaise and spices. The presentations of the chicken is the fun part and the show stopper. I encourage you to give it a try for your family and see if they enjoy this version better than the whole chicken with the hollow center. Learning to spatchcock a chicken is easy. I used this tutorial for my first attempt from Food 52. Click on link to see the steps. 1. Preheat oven to 450 degrees. Below you can see that I used a cookie rack over my cookie sheet to bake the chicken. Use this method or find something similar. You want the heat to be able to get under the chicken too. 2. In a medium bowl add the remaining ingredients. Taste the mixture. Grapefruits have a tendency to be bitter if not fully ripe. Add more honey if this is the case to make it taste a bit sweeter. If you don't have or want to use grapefruit, substitute orange juice. 3. 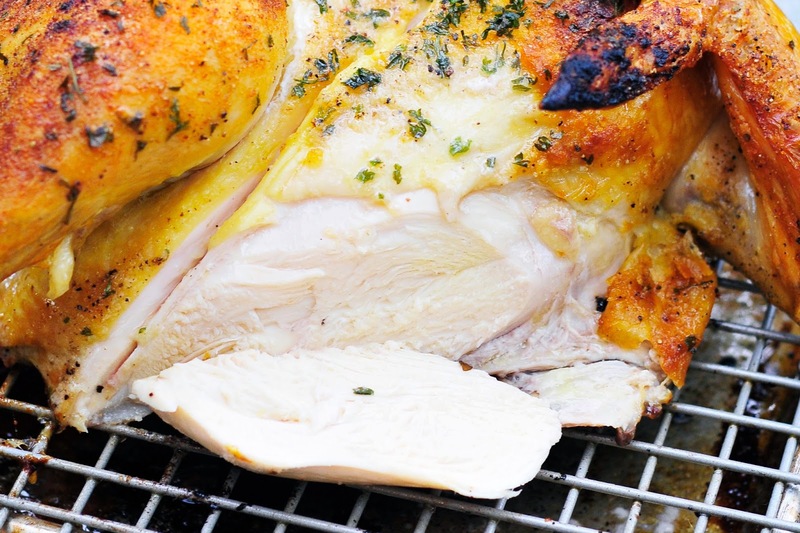 Cover the whole chicken with the marinade. See picture below. 4. Bake until chicken's internal temperature reaches 165. Mine took about 40 minutes but ovens vary and this will need to be monitored based on how you know your oven to bake. 5. 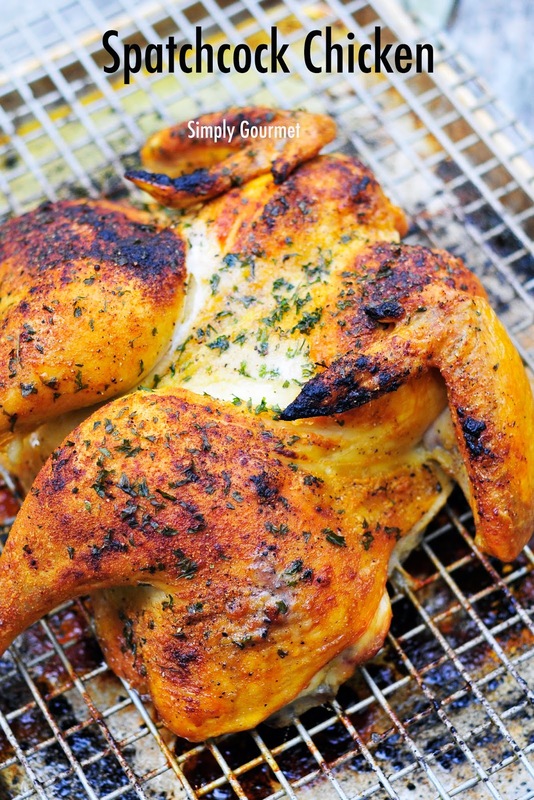 Remove chicken and let rest for 10 minutes. I use a pair of kitchen scissors and portion up the chicken. Save any leftovers and store them in the refrigerator. YUM! This looks so delicious! I'm with you, I love the skin and the dark meat as well. And the funny thing is, my whole family is into accents and impersonations (we're the funniest people we know, LOL). Although, I stink at accents, so it's just an opportunity for the rest of the family to laugh at me (all in good fun, of course!) But I do think I have to give this spatchcock chicken a try (I said that with my best English accent)! LOL--I think I make my family laugh too with my shallow attempts but it is all in good fun. Thanks for your comment. Gorgeous, and one of my favorite techniques! Love the flavor profile of your marinade! Thank you!